These are the times when squats and autonomous spaces all around the world are experiencing a big fall due to governmental opression, strict housing laws, fascist attacks, lower and lower number of people who still have the passion and interest for this form of the struggle – so it’s of a huge importance to participate and support on your local level! 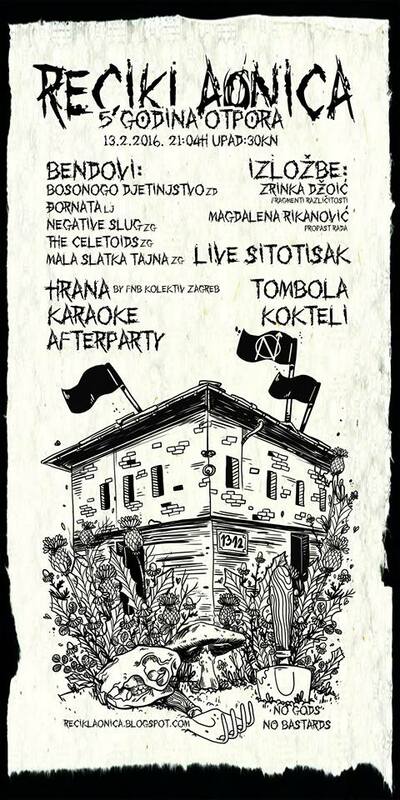 Reciklaonica is a political squat and collective based in Zagreb. Aside from it being a home for dozens of people, dogs and cats, it also gave birth to projects such as a bar/club, rehersal room, tool workshop, bike workshop, Free shop, anarcha infoshop, antifa gym, diy screeen printing lab, a permacultural garden etc. which all function on principals of solidarity without which this (or any) squat/project wouldn’t exist. We want to invite you to participate in Reciklaonica with your heart, with your skills, with your ideas… the same as we want to motivate you to squat&create something in your area. This entry was posted on Monday, February 8th, 2016 at 16:25 and is filed under Music. You can follow any responses to this entry through the RSS 2.0 feed. Both comments and pings are currently closed.